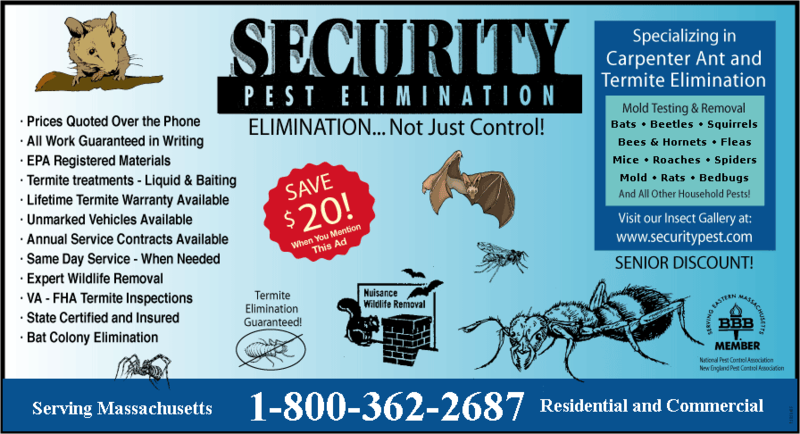 Security Pest Elimination is a Massachusetts family owned and operated local pest control company. Our pest control exterminators are highly experienced in elimination of all types of household pests and pests found in commercial buildings. Some of the more common pest control services that we perform for our Lynnfield Ma customers are mice control, bat removal, bee & wasp nest removal, squirrel control, ant control and termite control. We employ highly skilled technicians who have been trained in the latest pest control techniques. Our Lynnfield MA pest control technicians are State-Certified and Licensed professionals with more than 9 years of hands-on experience. Security Pest Control exterminators are constantly receiving updated pest control training on all types of household pests. Our Lynnfield Ma pest control exterminators also receive regular training for wildlife removal such as bat removal, squirrel removal and on humane wildlife trapping techniques. Security Pest Control understands the importance of sending out properly trained and equipped pest control technicians to your Lynnfield Ma home who understand the specific pest problems found in your community. At Security Pest Control we take your family’s and pet’s health very seriously. Our pest control technicians use safe effective low-impact, low-toxicity insecticides together with non-chemical and exclusion methods, as applicable. After a thorough inspection by one of our friendly and knowledgeable state-licensed technicians, we’ll apply our highly effective, low toxicity pest control system. With just one application you will have the peace of mind knowing that we have protected your Lynnfield home with state of the art pest control treatment methods. In addition, we can provide long term protection to your Lynnfield MA home with our semi-annual pest control maintenance program. When you call our office you will always get a live knowledgeable staff member to answer your pest related questions. We fully explain our treatment methods, not just quote you a price over the phone. We strive to perform a very high level of service to all our Lynnfield MA pest control customers. In addition, we always strive to be on time for our service appointments. Mice & Rodent Pest Control: No one wants a disease carrying mouse or rat scurrying around their Lynnfield MA home and living in their walls. They can cause structural damage, contaminate food and water, spread rat bite fever, and they are even known to be the culprit behind numerous structural fires (from chewing electrical wires). We perform all kinds of rodent control in Lynnfield MA from mice control to rat control. Ant Pest Control: Security Pest Control performs all kinds of ant pest control in Lynnfield Ma. The black ants called carpenter ants are the most damaging. These black ants cause even more damage than termites and need quick eradication to prevent further damage to our Lynnfield Ma homes. Carpenter ants are especially attracted to areas of damp and water damaged wood. This could be inside your walls under a leaking window sill, behind the exterior siding or anywhere on your home where there is leaking flashing. Carpenter ant treatment is one of the most common pest control services we perform in Lynnfield Ma. Our pest control exterminators use a safe odorless, low toxicity treatment that the ants will track back to their hidden colonies. Our ant treatment will quickly eliminate your home of these damaging ant pests. Termite Pest Control: Security Termite control is one of Massachusetts most respected termite control companies. We specialize in fast and low toxicity termite elimination treatments. Security Pest Control’s termite control technicians can eliminate a termite infestation from your home as quickly as in a few weeks. Termites are a very common pest in Lynnfield MA. During spring time, you may notice small to large swarms of small winged insects inside your basement or outside your house. These termite swarmers are being pushed out from the ground from established termite colonies in your yard or under your house. The purpose of the reproductive termite swarmers is to spread out the growing colony and get established in new areas. If you see termite swarmers you will need a termite pest inspection of your home. A termite inspection is a must to determine the extent of the termite damage to your home. Wasp and Bee Pest Control: Carpenter bees and yellow jackets are the most common bees we perform pest control services for in Lynnfield Ma. The carpenter bees can be seen hovering up around your upper roofline on sunny spring and early summer days. They drill 1/2 inch tunnels into the upper wood trim and live and reproduce inside these tunnels. If untreated woodpeckers will eventually notice them and start pecking holes into your house trying to locate them. Carpenter bees might do a lot of damage, but yellow jackets are the number one stinging insect we perform pest control services for in Lynnfield Ma. They build paper hives under your overhangs, behind shutters, inside your walls, inside your shrubs and inside rodent burrows in the ground. They cause the most causes of emergency room visits for allergic reactions than any other stinging bee or wasp. Bat Control: Big brown and little brown bats are frequently found in attics in Lynnfield MA. They can get in through very small openings in dormers, under trim boards and through vents. We perform exclusions for bat removal. Our bat control specialists will seal up all roof openings and then force the bats to exit your house through one-way bat exit doors. This is the quickest most efficient way to rid bats from your house. Our bat exclusion services carry long extended warranties. Squirrel Removal: The most common animal control service we perform in Lynnfield Ma is for squirrel control. Stealing seed from the numerous bird feeders available has helped their populations to increase. Squirrel removal from attics is the most requested squirrel control service. Even flying squirrels have been found in Lynnfield MA. Security Pest Control exterminators working in Lynnfield MA are experts in all types of squirrel removal situations and can quickly solve any squirrel problem. Bed Bug Pest Control: Bed bug elimination is the most difficult pest control extermination we perform. Only a skilled and experienced pest control technician can find and completely eliminate a bed bug infestation from your Lynnfield Ma home. Bed bug treatments need two scheduled treatments for us to eliminate this major pest. Bed bug aren’t just found in urban areas. We perform many bed bug pest control treatments in Lynnfield Ma every month. People who travel a lot have a greater chance of picking them up in their suitcases from motel and hotel rooms and bringing them home.